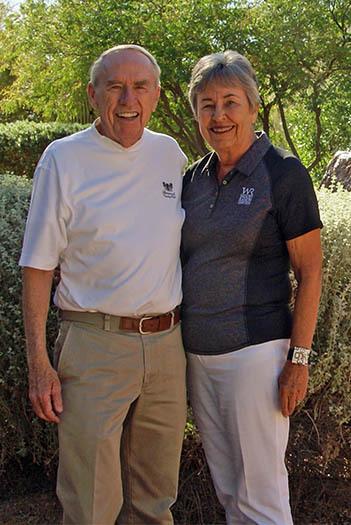 Howard and Mary Wennes deserve the designation of “The original stakeholders of Spirit of the Desert Retreat Center.” Stakeholders are people who annually provide substantial financial support to Spirit in the Desert. However, prior to 1993, there were no stakeholders because Spirit in the Desert didn’t exist. In 1993, Howard Wennes was Bishop of the Grand Canyon Synod of the Evangelical Lutheran Church in America (ELCA). He had been informed by Pastor Lloyd Wallace of American Lutheran Church in Sun City, Arizona that a couple, who were members of the congregation, were interested in making a large donation to the Lutheran Church. Bishop Wennes met with Mac Estrem for breakfast. After discussing possibilities for their gift, the Estrems decided they wanted their money to go for the establishment of a retreat center. Mac envisioned a place set apart where people of all faiths and anyone seeking spiritual renewal could experience reconciliation, healing, and transformation. The dream of a retreat center in the southwest was made a reality with the Estrem’s gifts totaling nearly three million dollars. Reflecting on the momentous meeting, Howard said, “That was a million-dollar breakfast.” Bishop Wennes, and others, became involved in locating a fantastic facility on nine acres of beautiful desert land in the heart of Carefree, Arizona. The facility was purchased and donated to the Grand Canyon Synod of the Evangelical Lutheran Church in America who subsequently organized the retreat center as a separate non-profit organization. It took a great deal of effort to organize the retreat center, develop programs, and find donors for more buildings. Mary and Howard were involved every step of the way turning the gift into the reality of a retreat center. In 2016 more than 3,800 people from all over the U.S. and 41 countries participated in 151 programs at Spirit in the Desert. Program offerings continue to grow and the number of people participating in retreats is significantly increasing. Mary is currently a member of the Board of Directors, and over the years, Howard has served on the Center’s Board of Directors. (You can learn more about Mary by reading her Director’s story: “Global Citizen and Activist”.) In addition to bringing their time and skills to Spirit in the Desert, the Wennes have continued their annual Stakeholder financial support for more than twenty years.